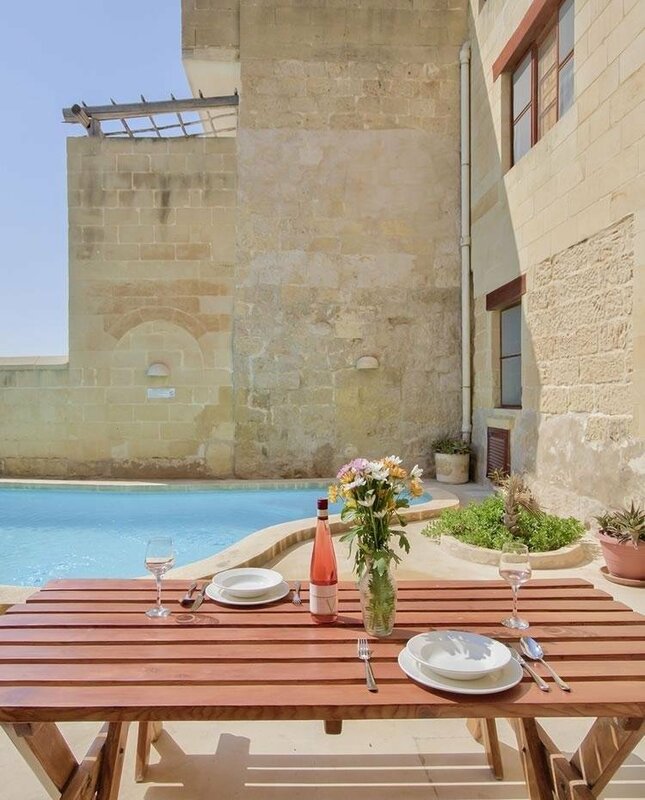 Gozo Farmhouses Estate Agency was established twenty years ago, in response to many enquires made by clients staying in our farmhouses, wishing to purchase property for themselves. Since then, our services have provided many overseas buyers with a delightful base in Gozo at a reasonable price. For further enquiries contact Mr. Paul Scicluna on Telephone No: (0356) 21 561280, Mobile No: (0356) 99493495 or email info@gozofarmhouses.com. Newly built Farmhouse in traditional rustic standards with new and old stones, wooden beams and other features. Situated in an alley in the village of Xaghra close to the Neolithic Temples of Ġgantija. Accommodation consists: hall way that leads to a sitting area with fire place, fully equipped kitchen/dining that over look the swimming pool, one twin bedroom and shower/wc. Stone stairs leads to double bedroom with balcony and ensuite bathroom (Jacuzzi bath), another twin bedroom with ensuite shower/wc and terrace with open stairs to roof from where there is fantastic view of the country and sea. Drive-in carport and the swimming pool is 7.5m x 3m x 4m. A rare opportunity to acquire this unique SEMI-DETACHED FARMHOUSE perched high on the CLIFF's EDGE enjoying breathtaking Sea and surrounding picturesque Country Views from a 55ft WIDE Pool/Deck Area. Offering an entrance onto Pool Area leading to a Lounge/Dining Area overlooking Cliff Hanging SWIMMING POOL and ample Deck/BBQ Area, 2/3 Double Bedrooms and Bathroom (with Jacuzzi), Guest Toilet/Shower and Washroom. Situated right on a cliff with open sea and country views. Located in the peaceful village of Żebbuġ, not too far to the centre of the village. Entrance overlooks the pool area and lead to kitchen/dining/living area combined, balcony and spare toilet. On first floor: double and twin bedroom, both rooms with balcony, bathroom with Jacuzzi bath and stairs up to top roof.